This 1929 Griffon is the oldest bike I have restored. 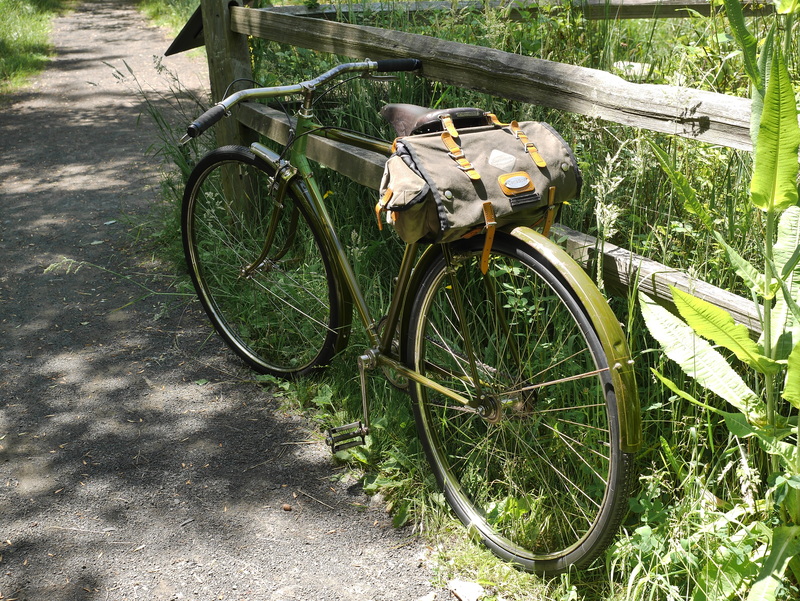 It is in fantastic condition for its age, but even so, there are some elements of older technology on this bike that kind of gave me the willies today as I set out to take the bike on its first test ride. 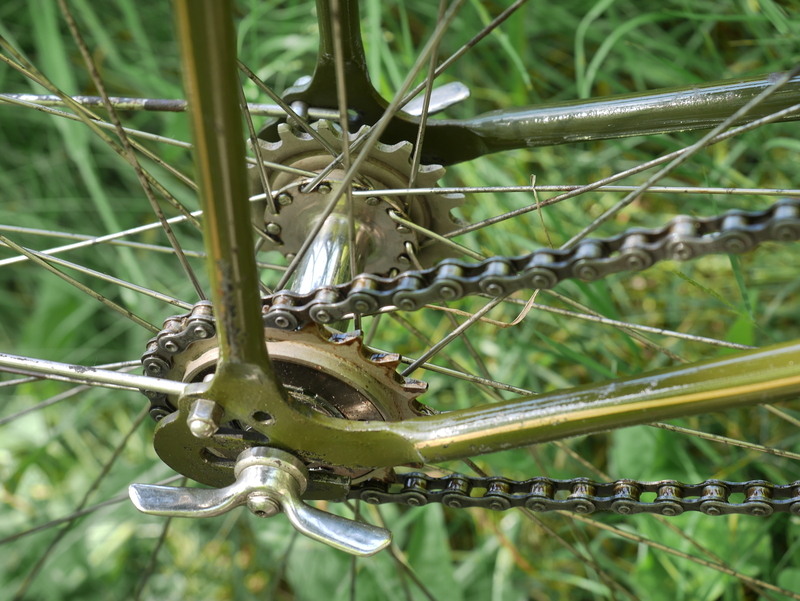 The bike has Westwood style steel rims, color matched to the frame along the spoke bed area, and with chrome for the braking surface. Let’s talk a bit about that surface. 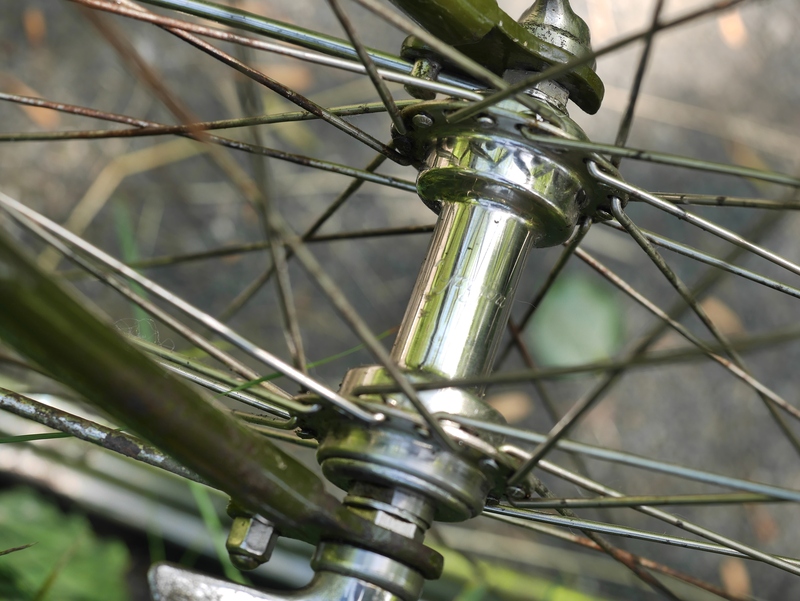 Westwood rims are usually found on bikes which use rod brakes. Those brakes pull up on the brake pads to strike the rim on the surface near the spoke bed area, rather than on the narrow, rounder sidewall area. This Griffon, however, has caliper brakes which push the pads horizontally toward the rim. 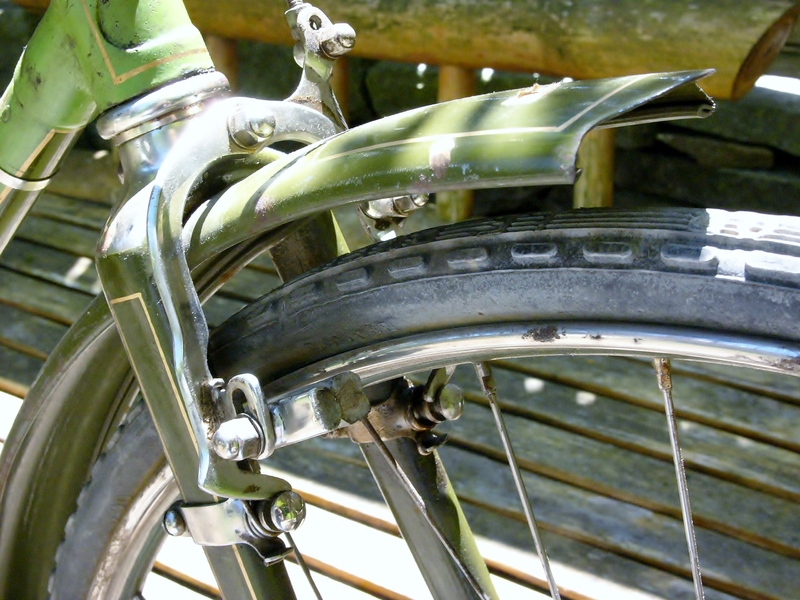 The original pads, shown above, feature a “pillow top” design which sort of grips the rounded edge of the chrome rim surface. Sort of. Even after sanding the pads using a small round file, I knew from testing the brakes on the stand that they would not be effective at stopping the bike, at least not very quickly. I thought of installing some orange Kool Stop pads for today’s adventure, but the ear piercing squeals emitted from the front rim on the set I tried out brought to mind a thousand hungry infants wailing all at once. So, I put the old pads back on and developed a plan. Motorcyclists (of which I am one) have some skills that many non-riders don’t know about: the ability to ferret out non-disgusting bathrooms while riding at speed and peering through a helmet visor is one of them. Another skill is knowing in the back of your mind where every single flat, empty parking lot can be found on a Sunday afternoon – these are lures for practicing slow speed maneuvers, which is a must for motorcyclists who take safety seriously. The latter skill came in handy today. I first drove the bike to my nearby huge empty parking lot. The bike’s wheels barely fit into the wheel wells of my car’s bike rack. Its wheelbase is 113 cm, one of the many oversize features of this great old machine. 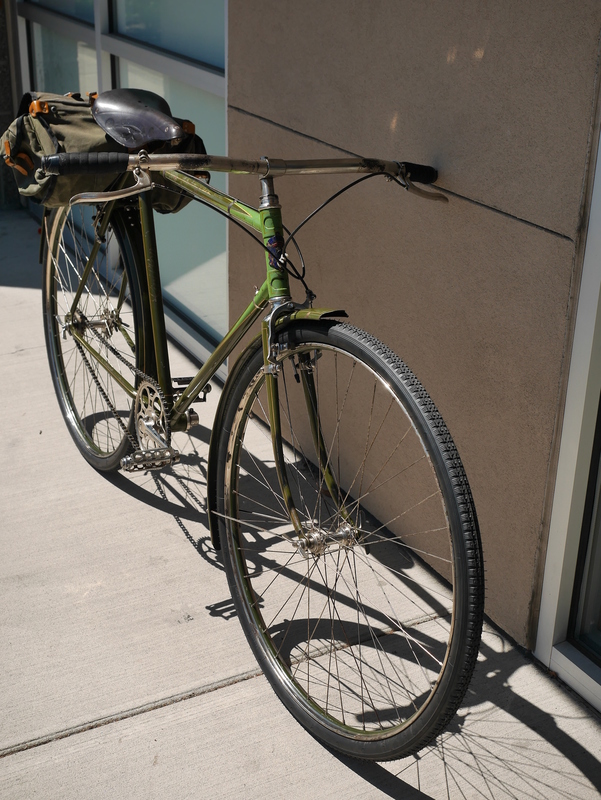 After getting the bike off the rack and strapping on an old Carradice saddlebag, I leaned the tall bike over and hopped up on the long, leather Glorieuse saddle. Then I sailed around the parking lot, gingerly at first, and began accelerating and then attempting to stop. After a while I found just the right combination of body english and leverage and was able to bring the bike to a halt after several wheel revolutions at speed. Not bad! 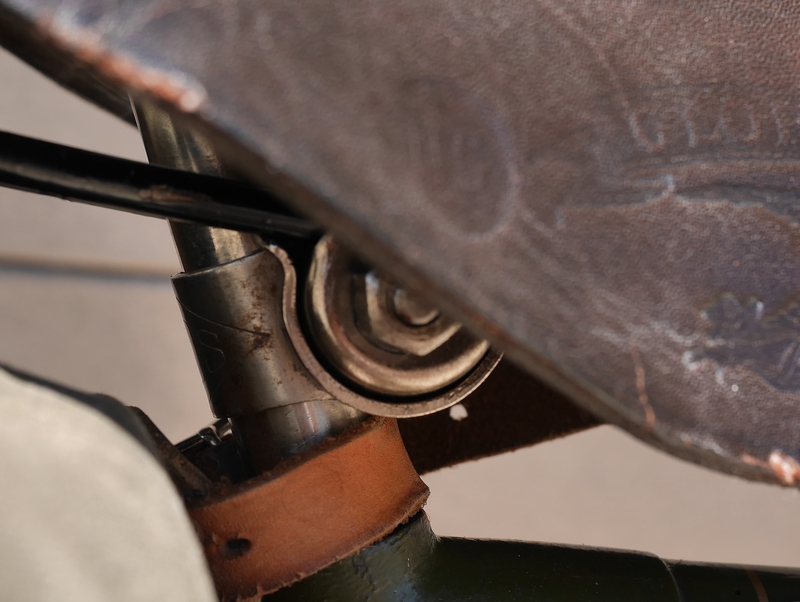 The front brake had a bit of chatter, and did not perform as well as the rear brake, so there are probably some minor adjustments to be made to the position of the clamps which house the springs and which have a groove along which the caliper arms travel. Each clamp needs to be positioned just right so that both brake arms move evenly and in tandem – see below. To make it possible for me to ride this bike, with its 59 cm top tube, I reversed the saddle clamp and also shoved the saddle forward on its rails, to bring the saddle as close to the handlebars as possible. The 66 degree head tube kind of counteracts the effect of the long top tube, but because the stem is very short, this didn’t help as much as I expected. The ginormous bars are 78 cm across – the widest bars I have seen on a bike. Even the bar diameter is oversized – 25 mm on the grip area. 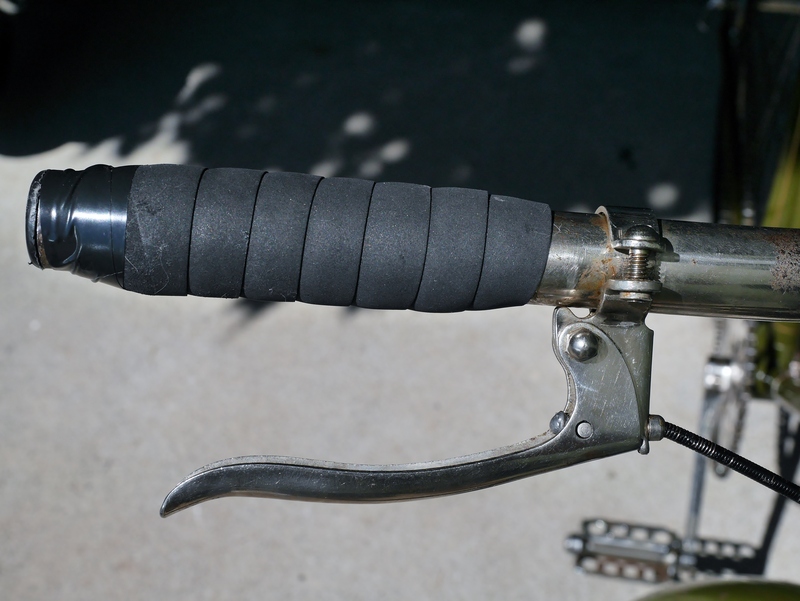 So, no grips of any kind, modern or vintage, can be installed. 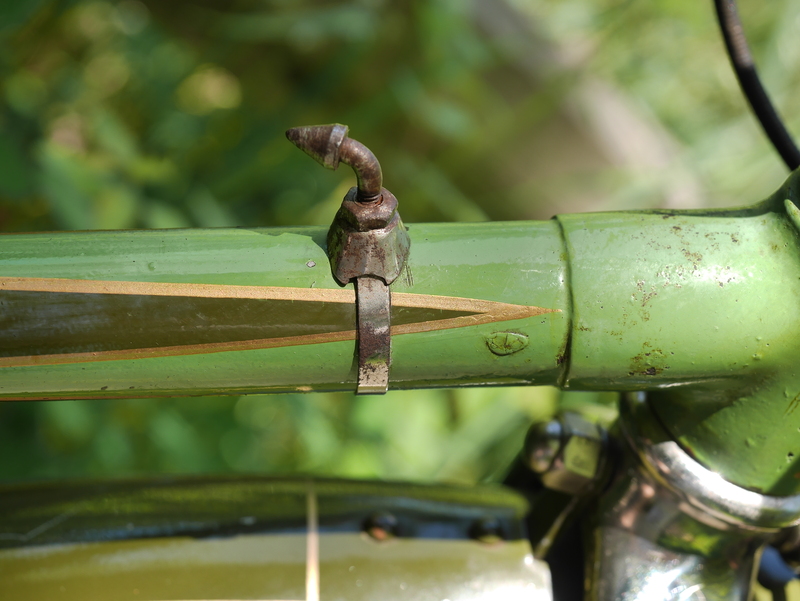 Probably, the bike originally had wood grips. But, finding the right size vintage wood grips now will be a challenge. In the meantime, I hastily added some cork tape to make my ride more comfortable today – which doesn’t look too bad from afar, but not so great close up. I ended up resting my hands on the curved section of the bars, which was enormously more comfortable than having my hands on the grips. The bike seems to have been designed for a long-armed broad shouldered giant! Seriously though, probably the wide bars were useful in providing leverage over the cobblestones and rough roads of the time. 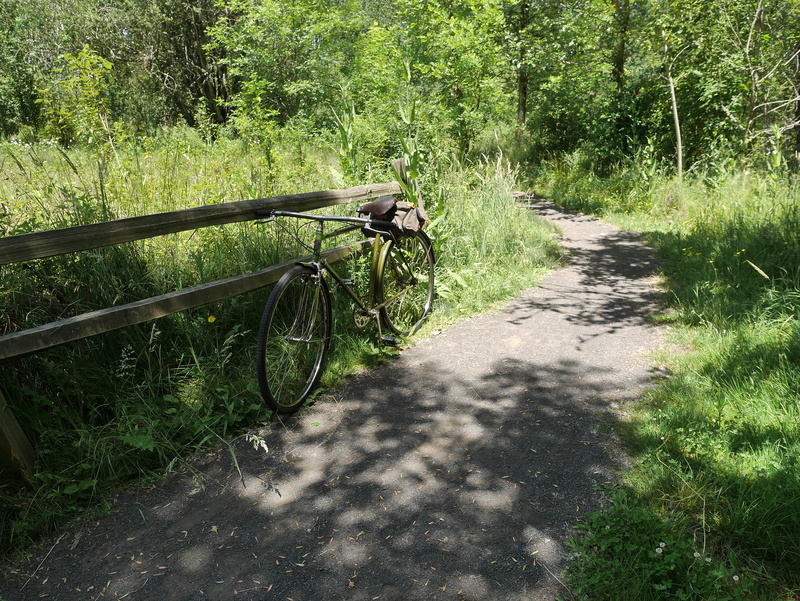 Once I felt fairly confident about riding amongst the masses, I headed over to Springwater Trail and took a short jaunt to my favorite tiny getaway – Tadpole Pond. I enjoyed getting the bike up to speed, and was greeted with smiles, and some astonishment, by other cyclists I encountered today. The weather was perfect for riding, and I stopped to enjoy the birds and wildflowers. The Griffon fit right in, looking a bit like a hobo bike. Given all the homeless tents I encountered along the trail (camping a la Portland-style), the Griffon was a natural. Elegant Griffon lettering, paint in wonderful shape. Flip/flop rear hub with freewheel and fixed gear. Chrome Griffon hubs front and rear. 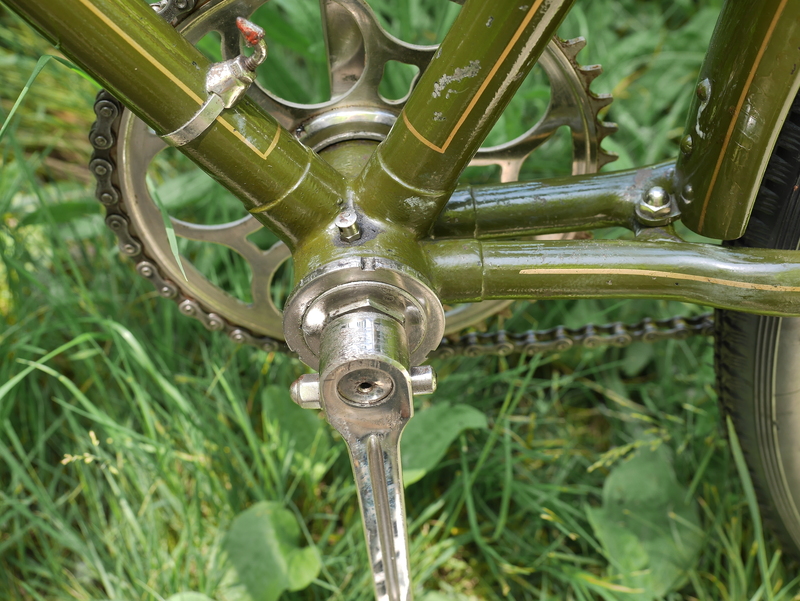 Box style lining intact, oil port on the bottom bracket, beefy chainstays. 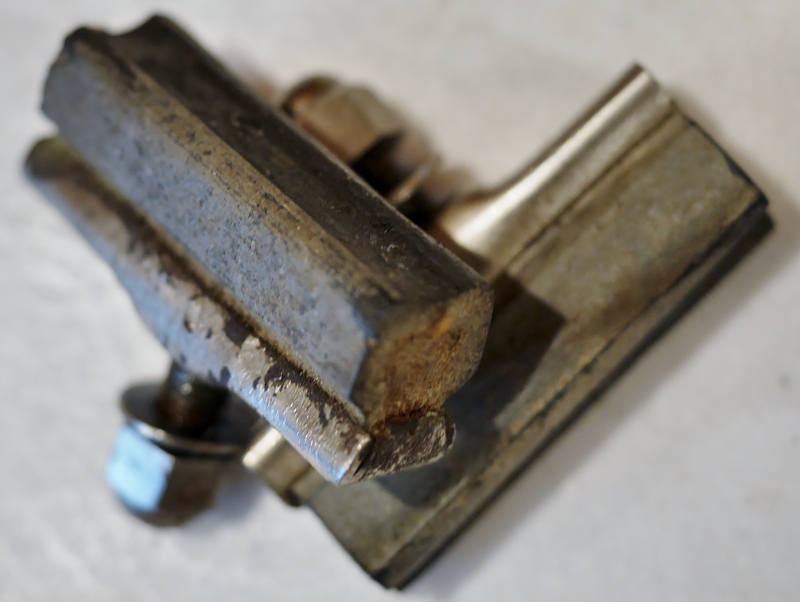 Clamp-on pump peg, frame paint details. The lighting was just right for taking some close-ups of the bike’s features. 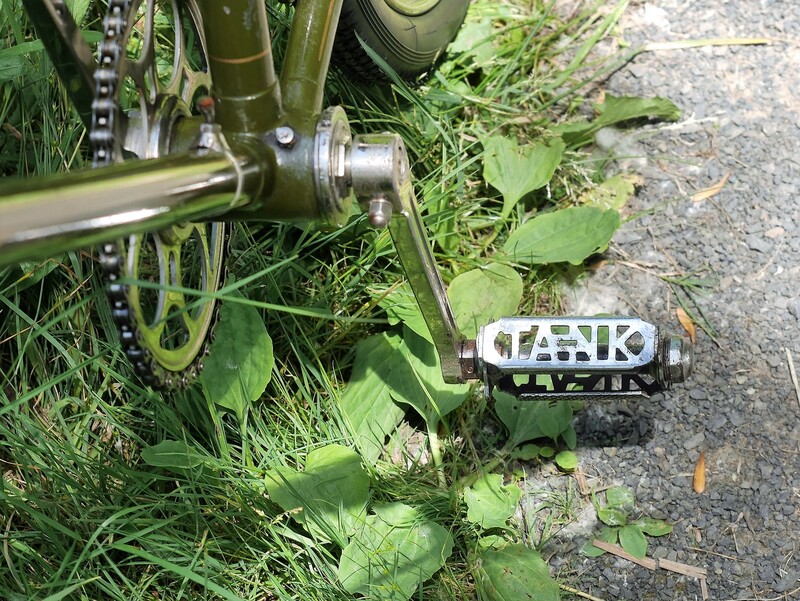 The 1940’s Tank pedals are from another project – the bike didn’t have pedals when I acquired it – but they look just right on this bike and worked fine for today’s ride. The Griffon head badge is one of my favorites, featuring the mythological flying Griffon in blue and gold, encircled in red. 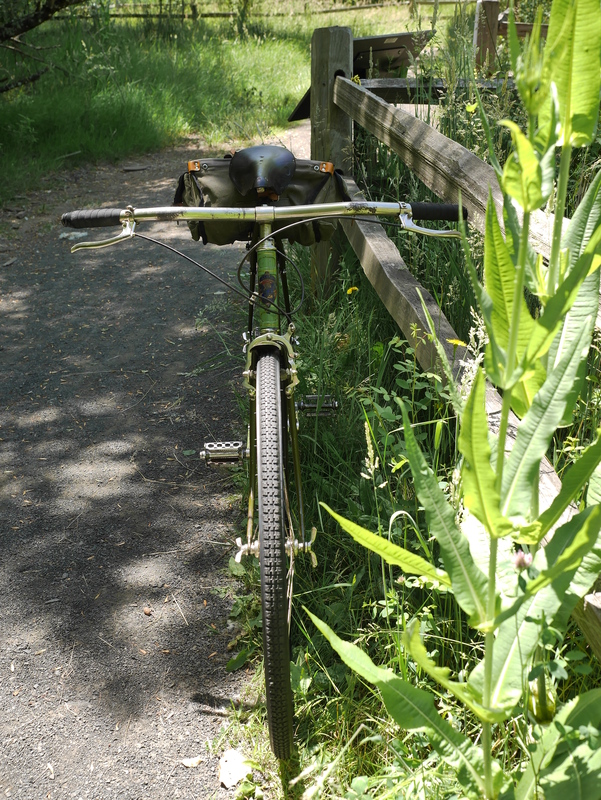 I had no mishaps riding the trail today, even when some pedestrians walked out in front of me – we all just laughed as I swerved and screeched to a halt, Griffon – style. 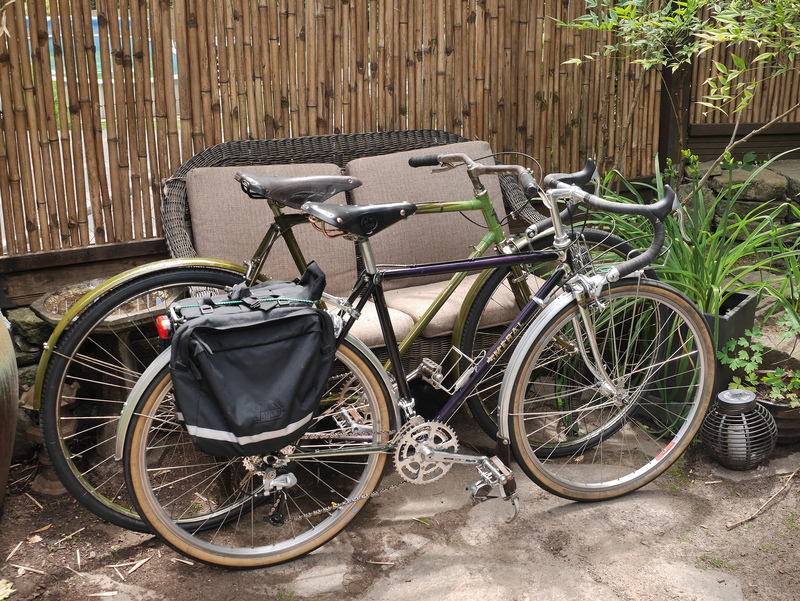 You can see how long, tall and wide the bike is by comparing it to my Meral, which has 650b wheels and a 49×51 cm frame. 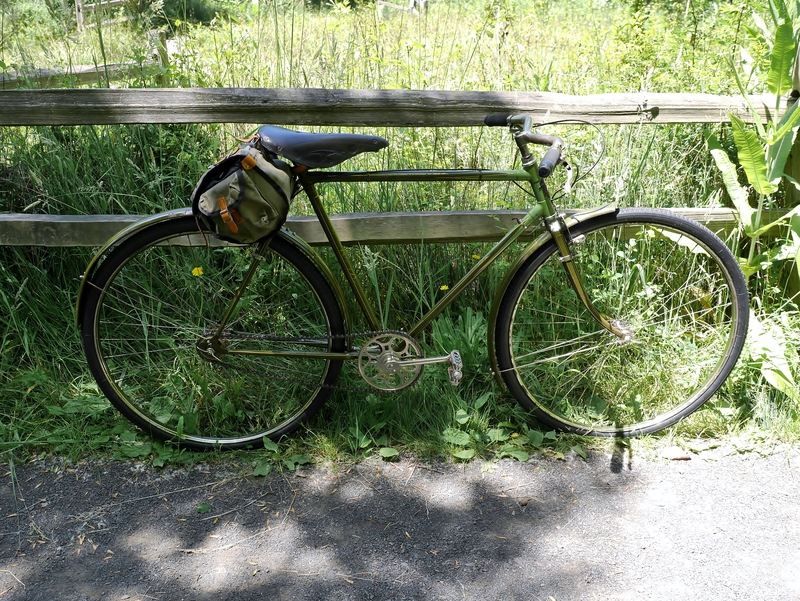 Not only did the bike comport itself quite well, with the old Peugeot freewheel ticking sweetly while coasting, this ride reminded me that perhaps we are all too consumed with finding a bike that is just the right size, instead of riding the bike we have. 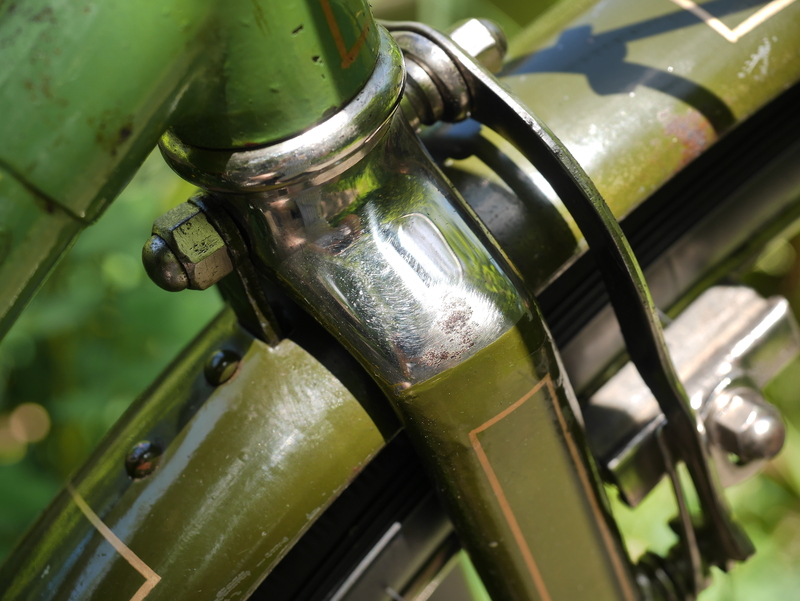 Lots can be done with saddle, stem and handlebar adjustments to overcome a bike that is a bit too large or too small. Today’s ride proves that some bikes can be adapted to a wide range of rider height. 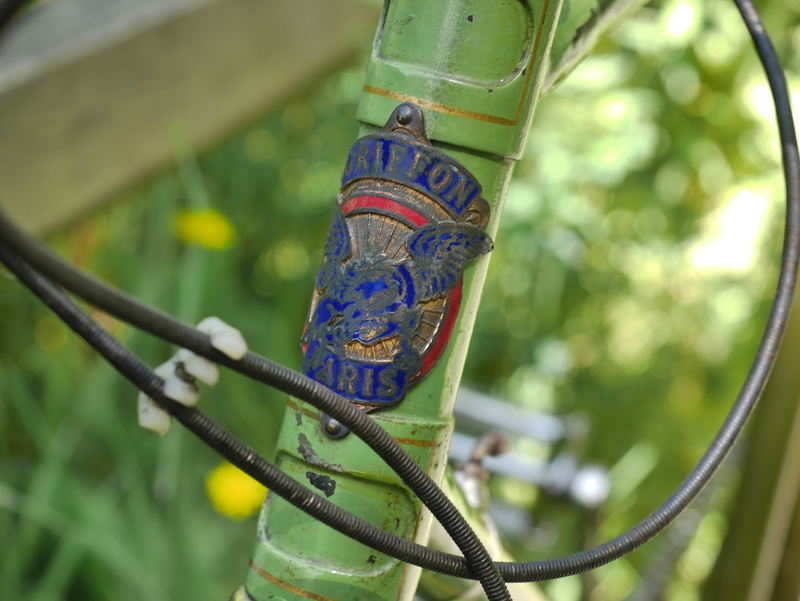 This entry was posted in Bicycle restoration, Griffon Bicycles, Peugeot bicycle, Vintage French Bicycle and tagged Griffon bicycle, Peugeot freewheel, Westwood rims by Nola Wilken. Bookmark the permalink. I’d love to see that Schwinn! 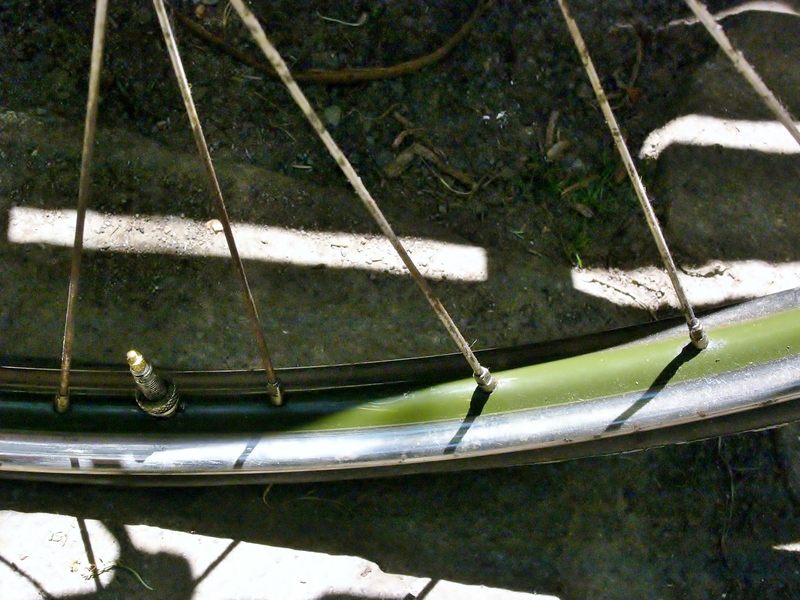 I am contemplating what to do about a steel fork with bad paint that I stripped down to the bare metal. I was thinking of clear coating it, rather than trying to get it chromed or painted. Sounds like just the wax is holding up on your frame – presumably you are keeping it in dry storage? In the garage.It does get wet when I ride in the rain..wipe it off when i get in..the water seems to bead some..the 62 corvette had been painted when I got it with some kind of house paint..it has been stripped for a couple years..I also have it waxed…I tried painting it myself..just didn’t look good to me..was my bad paint job..stripped it and keep it bare also..I tried clear coating my forks and the clear coat started to peel some..ounce again it could be me..Briwax seems to work the best for me after a year no rust coming through..it does change the metal a little but holds up well..I tried several methods to keep the frame from rusting,car wax..polish..boiled linseed oil worked but never dried..always sticky and picked up dirt and anything else that was around..You would think I would just get them painted..sort of like the raw look..
Those bars are crazy wide! They rival some of the downhill mountain machines of today. Apparently, in mountain biking, wider offers more control and better positioning for balance. This makes you more stable and slower to fatigue. But, that’s a whole different type of riding. Those who rip aggressive trails at higher speeds are much more likely to benefit from a wider bar. I don’t see thrashing about on the mean Parisian streets being much the intent for this bicycle. Either way, this is a gorgeous find, Nola. What a survivor. Especially one in such sublime condition! The paint impresses me, especially the box lining. Though, I’m a sucker for tasteful, custom paint flair. Cobblestones can tear the bars right out of your hands. 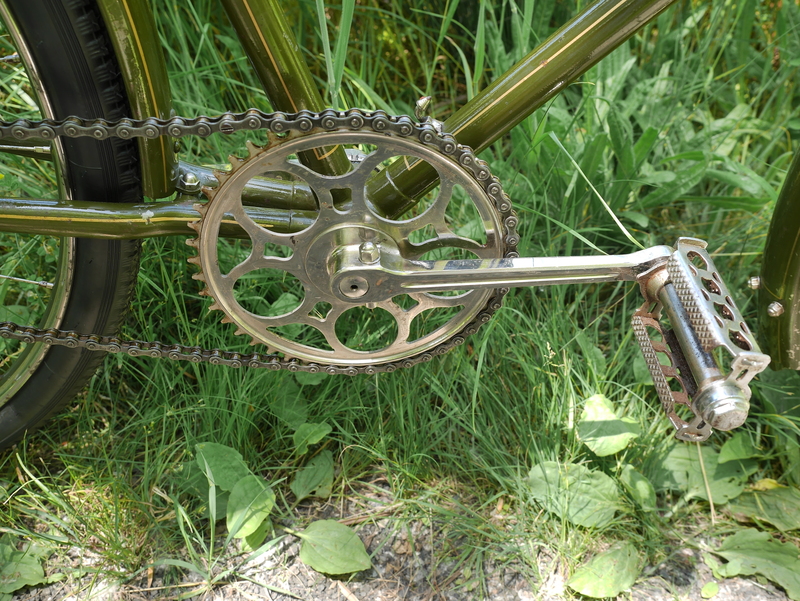 The forward-sloping head-tube and wide bars are meant to rectify this. The paint and condition are very impressive. The chrome is pitted in some areas, but overall it is a totally rideable machine, and doesn’t need much to keep it going, except better brake pads. Wow, wow, Wow! How many miles do you have on it, so-far? Would you say the ride characteristics are pleasant, with the long wheel-base? The condition is superb: It appears to be about ten years old. Those chainstays look delicious. Could we get another look at them? Fibrax might have some replacement, period brake blocks for you. I like what you had to say about bicycle (frame) size. 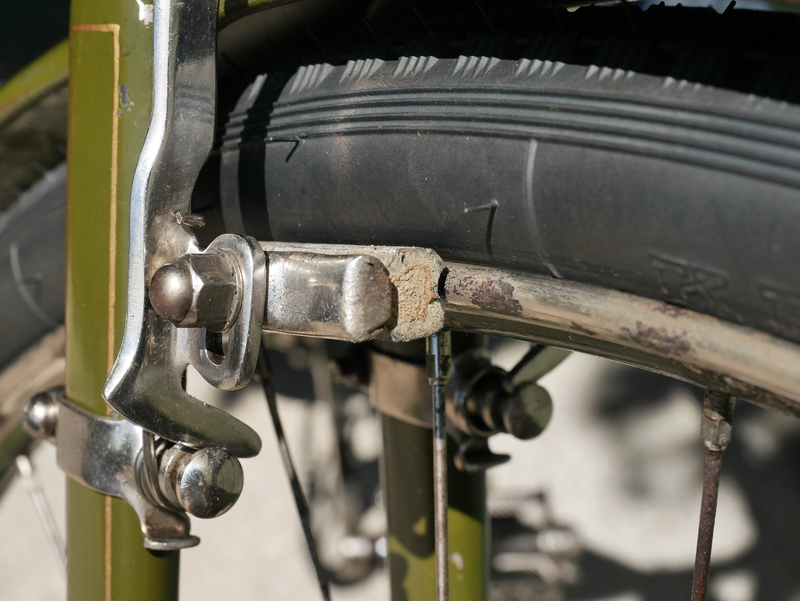 I have a photo of a 1922 F. H. Grubb with the 66 degree head and seat tube angle. I like the “windows” on the head tube lugs. 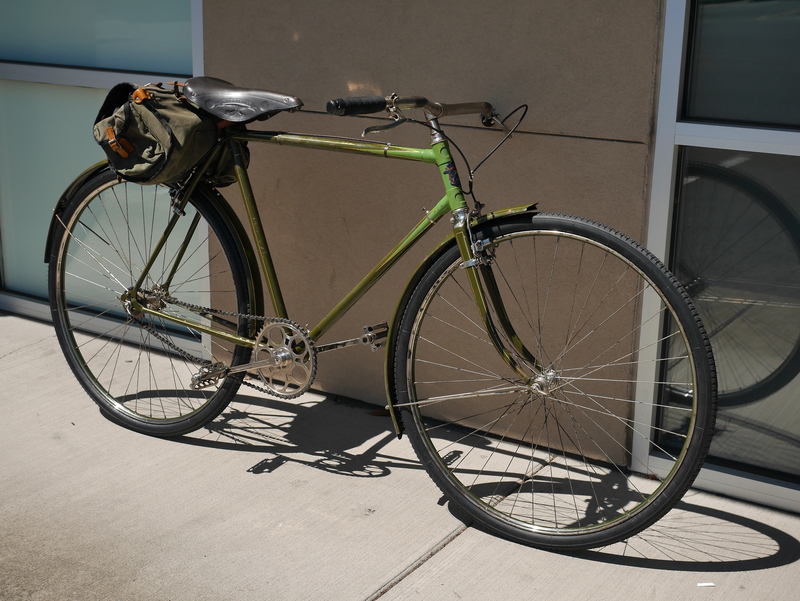 Thanks for sharing and telling your story of this bike. Are you going to settle with its present set-up/condition? Yellow Jersey has some leather lined brake pads which might work well for these calipers and the Westwood rims. As far as I can tell, the bike is 100% original, so I won’t change anything, except to be on the look out for the correct grips and pedals. 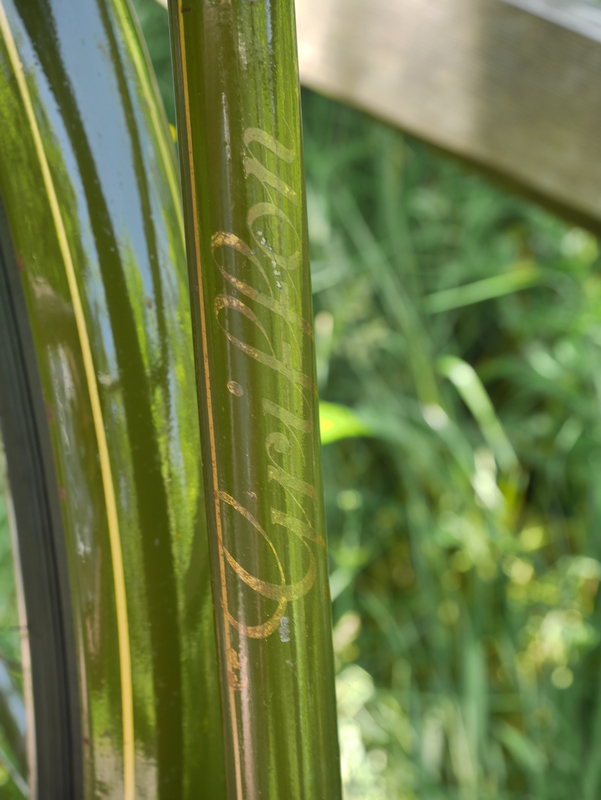 There are more photos of the bike in various posts – if you type “Griffon” in the search box the posts will populate. As usual it’s nice to read your post. To short your bike, can you reverse the stem back? It reminds me because I used to apply myself this unconventional position while my upper-back was painful. Hi Laurent – that is a possibility as well – the handling might feel a bit funny with the stem reversed – but sounds like it worked for you.